Contemporary / New Age piano music in the world. Check out the six pages' worth of piano album reviews offering the listener the perfect means of relaxation. Over seventy reviews of excellent CDs. Every second is pure Piano-Heaven. Why not join the popular Piano-Heaven Facebook page? With around 1800 followers, you'll be in good company. Each month, hear a selection of piano recordings from some of the finest musicians around. Eamonn Karran releases his third CD on the Real Music label- 'Celtic Skies'- it's sure to be another winner! Michael Jones's favourite piece of music: "My favourite music selection is the Chopin Nocturne in E flat minor - Chopin's music is all based on the language of touch and the beauty of his touch carries through this entire composition with extraordinary beauty." 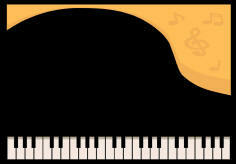 Wherever you are, from Barrow-in-Furness to Brisbane, please like Piano-Heaven on Facebook and help to spread the word. Click the 'Like' button above. Join around 1800 other followers and hear regular piano track picks. Thank you! "The piano is the simplest way for me to express my soul." "Love each single note and the silence that surrounds it, and the world will stop."